description = An original motion picture experience from inside the Greater Philadelphia Region. 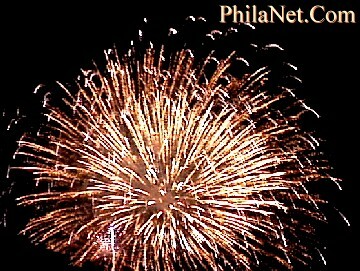 Q: Where Can I See Free Fireworks on the Fourth of July in Philadelphia? In the Greater Philadelphia Region, the week prior to the Fourth Of July is traditionally filled with nightly firework displays. The most spectacular to witness are in Center City Philadelphia. Leading up to the 4th Of July, you can usually see fireworks at the Art Museum and the Sporting Arenas. Penn's Landing is "the" spot to be on the Fourth. However, viewing any fireworks in Center City can be an unpleasant experience due to over crowding, lack of parking, etc. A great alternative to Philadelphia's ceremonies... visit a suburban town. Many local communities throughout the Delaware Valley host their own 4th Of July carnivals, fairs and fireworks. If you are taking your family, nothing beats the annual charity event at the Wissahickon High School in Montgomery County, Pennsylvania. The Friday before the 4th (or Saturday if it rains) at about 9:15 in the evening the skies outside of Ambler light up in a wonderful display. Look for groups of people to find the best viewing locations. Just throw the kids in the back of your utility vehicle and put the tailgate down in any public park. If you arrive early enough, you can throw a blanket down right in front of the display area at the middle school. The fireworks display is consitantly ranked as one of the best in the nation. The charity carnival is also a good place to bump into old friends, grab a bite to eat and ride the rides.